Meet Percy Stinkson. He’s just a normal kid, trying to have fun and make it through school doing as little homework as possible. ...until he finds out he’s the son of a Greek god! And Percy’s father isn’t just any Greek god. He’s Pooseidon, God of Farts! Percy’s life is totally transformed as he travels to Camp Half-Wit, where he’s trained to use his special farting powers. He’s going to need these powers, because he soon learns it’s up to him to save the universe by going on a quest to find Zeus’s stolen iPhone! It’ll be a dangerous quest, but Percy will have company: Grover, a weird kid who thinks he’s a half-goat, and Annabeth, a super-hot girl who unfortunately doesn’t want to date Percy. Yet. There’ll be loads of action and and tons of smelly farts as Percy’s quest proceeds to its exciting conclusion: a showdown in the Underworld with Hades himself! The odds might be against Percy, but don’t give up hope, because he’ll have the ultimate weapon at his disposal: The Lightning Fart! Can a fart really save the universe? Find out...in this hilarious parody of the Percy Jackson books, THE LIGHTNING FART! My son thoroughly enjoyed this parody - especially on his new kindle! Although the writing is referenced from the original book and the writing is well written, it lacks the comedy that it advertises. However I assume since I favor the original more compared to the parodies, that this book didn't exactly meet my tastes. I do like the original a lot so I thought I'd give this a try. 4.0 out of 5 starsFun read. What a fun read.........and quick too. Loved all the references to other books and movies. Editing needed to be a little better but otherwise, a great parody. Very funny & entertaining. My 7-year old son liked the humor and I enjoyed the parody parallels. Well-written! 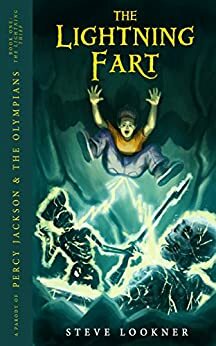 A hilarious funny parody of The Lightning Thief.